The game is set. The Black Panther, ruler of Wakanda, is being held captive and the military might of his entire kingdom has been turned on the one person who could free him: his wife and queen, Storm. But if Storm chooses to fight her fellow Wakandans and rescue her husband, she does so at a cost: she may not be able to save her teammates, the X-Men, who are in similar peril halfway around the world. Does Storm stand by the Black Panther or the X-Men? In the morlock Tunnels Shadow King takes over Cyclops. In the astral plane the shadow king lets Storm known that he has control of T’challa and Cyclops and she will have to choose between saving her love or the X-men. Nezhno refuse to use his powers and Storm is left to save them. She manages to flee and shoot down Cyclops plane before he gets back to X-men HQ to kill them. She lets Nezhno know about the shadow king right as the Dora Milaje attack them. 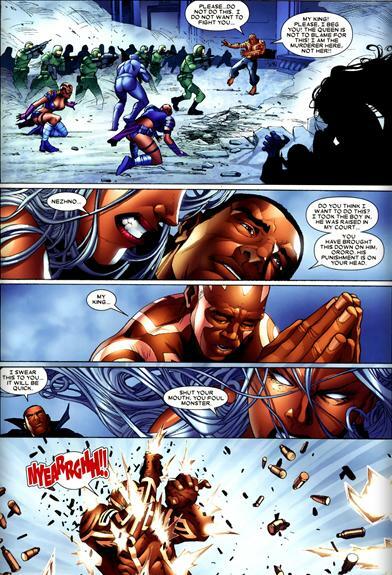 Storm is about to be killed when Nezhno finally uses her powers to stop them. Before they can catch their breath the shadow king in T’challa’s body attacks. Conflict- It’s clear that Chris Yost has made the center piece of this story the conflict over whether Storm can maintain her status as an X-men and her new rank of Queen. Storm refuses to choose instead she continues to fight on in the stead of both, how admirable. Characterization- This story made me realize just how much I truly miss a great characterized Storm. She manages to be awe inspiring with her powers and mastery of them and an inspiration to Nezhno who’s both a former student and a subject. I also love that Storm‘s thoughts are used as the books narration, it helps us to literally get into Storm’s mind and feel what she’s feeling. This also gives the issue a level of depth and emotion Storm rarely gets nowadays. Art- Gorgeous in every panel! The characters eyes deserve mention this issue as they conveyed emotion in a smart and impressive manner. Even without the words some of the most powerful and resonating pages revolved around these emotive eyes. Action- Great fight scenes especially the battle between the Dora Milaje and Storm which saw them feeling betrayed because of her actions and seemingly betraying their king and love interest. Storm meanwhile must contend with their superior skill and speed and her inability to concentrate and sue her powers. Vibranium– Yost also highlights something I can’t believe Ive over looked all these years; the properties of Vibranium. Nezhno gets shot at and thanks to his Vibranium tattoos the bullets are rendered useless because Vibranium always absorbs the kinetic energy of bullets before they can cause harm, Kudos Yost you know your sci-fi science! 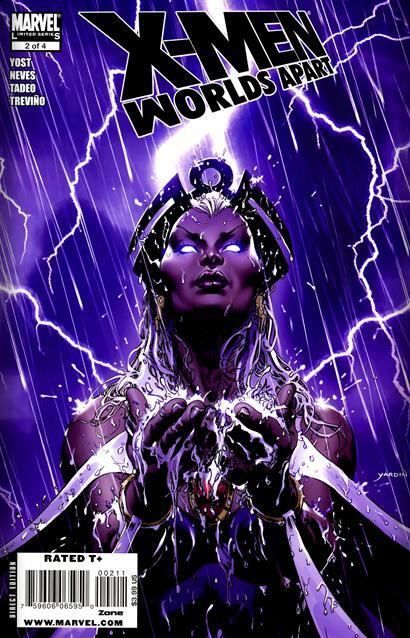 Cover- Stunning image of Storm with the rain falling all around and on her, eyes glowing and strong African features on storm. Loved it! 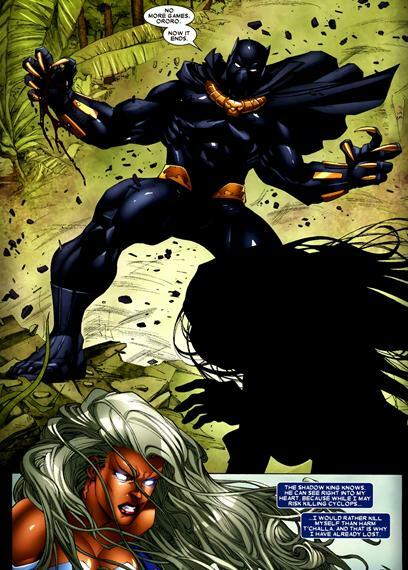 Hatut Zeraze– Still makes no sense why they are in this story or in Wakanda after they were exiled way back in the Priest Run of Black Panther which ended in 2002. No explanation given?? ?